What Is I Ching Hexagram 22 All About? 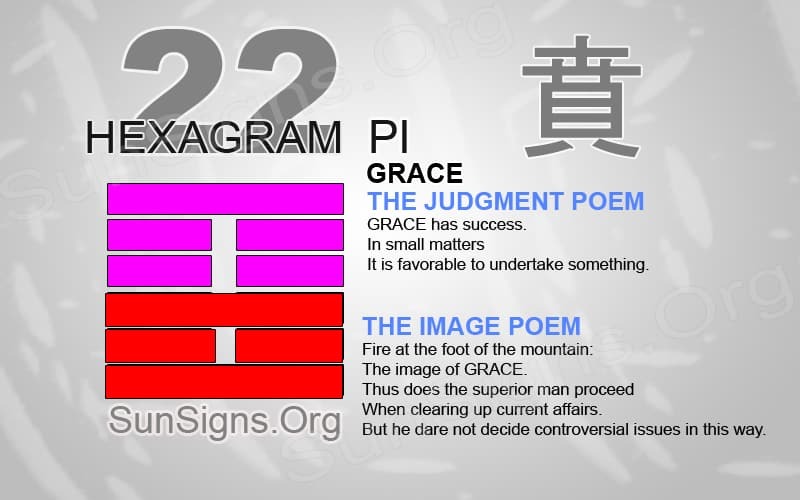 Pi is the Chinese name of the I Ching Hexagram 22. This has inner and outer trigrams forming mountain over fire. This Hexagram is called ‘grace’ or named ‘adorning’ or ‘luxuriance.’ Hexagram yijing 22 symbolizes beauty, but more importantly and particularly, inner beauty. Beauty is abundant in the world. You find it in several different forms of natural beauty to inner beauty. You find this deep within each person. It can sometimes be hard to see the forms of beauty around us. Finding splendor in all things is possible. That can sometimes be very difficult when outside appearances are very ugly. Looking beneath the surface often will help the viewer gain more knowledge about a situation or person. Outer appearances can be very confusing and misleading. When we do find beauty in unusual places, it can help inspire individuals to strengthen their inner beauty. Hexagram 22 represents the effort needed to see true beauty. Many people can be fooled by objects or people that are beautiful on the outside. But, they might have bad intentions instead of pleasant ones. Beware of incredible beauty or imitation beauty that can often be a disguise for something far uglier. If something appears to be too good to be true, often it is. Take the time to learn more about unusually beautiful truths. This can save time and wasted effort perusing something that is not true. Observing grace will allow a person to have high values for true beauty. Be aware of the difference between true and false splendor. This will help prevent unwanted circumstances of going down the wrong path. Be aware of the beauty around us. It is also important to take the time to observe the beauty within us. Everything and person has the potential to improve and blossom. Ponder how others see you and perhaps what beauty means to you when being analyzing what lies beneath. Examples of inner beauty can be kindness, being able to humble yourself. It can also be the will to serve others, and taking the time to be a good listener. There is nothing in this world that we can place upon our bodies that will change what type of inner beauty we radiate. That is why it can sometimes be difficult to see someone’s true beauty. This happens especially with our loved ones because it takes time and pealing back someone’s layer to discover this truth. A great change is sometimes needed for someone to radiate beauty instead of disease. But all things are possible when change is available. I Ching 22 says it is easy to put on a show with painted beauty and fake personalities. It is never safe to jump into a situation or a business deal without very little information when beauty is the one enticing the individual. Look deeper into job prospects and business ventures that seems to be very lucrative. There is much beauty that is left to be discovered in the world. By seeking out these examples, we can then put into place good actions in our own lives. This will help strengthen the beauty around us. It takes time and effort to bring about any change. But, it is possible to take a plot of land and enrich the soil to allow beautiful flowers to grow. Then all kinds of people will be able to enjoy the flowers and bring beauty into their own homes. Hexagram 22 is an inspirational symbol of the potential of each person and the benefits of recognizing beauty in everything. But this hexagram also warns against false beauty that is just as common as real beauty.